Value vs Growth: Is there a shift back to Value? Chart: Value vs Growth - have we seen a shift? We believe the real shift from Growth back to Value has yet to occur, the key reason for this remains: bond yields are exceptionally low. Whilst we have seen a small move higher in the past month, bond yields are likely to remain at or around these low levels for the near term. Low rates continue to disrupt the efficient allocation of capital as yield seeking investors are driven into riskier asset classes such as equities. Further, and as it relates to traditional value investing, we believe the growing influence of technology and associated increase in the rate of ‘structural disruption’ should not be underestimated – and there is evidence of that everywhere, from digital advertising to telecommunications and healthcare. ‘Growth’ stocks did do very well late last year and into the beginning of 2016. While the perceived growth and lure of easy gains did attract a lot of money in the short term, we don’t think value investing is ever out of favour. Generally the upside potential for being right about growth is greater, but the upside potential for being right about value is more consistent. During the recent reporting season we saw how savage the sell-off was in a few notable ‘growth’ companies who alerted the market to the slowing levels of that perceived growth. Examples of these include APN Outdoor, TPG Telecom & Aconex. Paying a low price is the ultimate source of margin for error. There have been some huge gains made in certain areas of the market recently, such as gold stocks that were way out of favour last year. Eye-popping valuations for high quality businesses are also making some people rethink owning certain stocks and funds that have benefited from the massive increase in valuations, that in most cases belie the anaemic growth in their revenues and profits. Given the strong performance of the US market (and therefore index funds and broad-based market ETFs) since 2009, value investors have struggled to keep pace more recently as valuations have in many cases reached levels that virtually guarantee meagre returns (if not large losses) over the next decade. But with monetary policy losing its effectiveness, the business cycle maturing since the recession in 2009, possibly higher interest rates, and a surplus of virtually everything putting pressure on prices, valuation will play a more important part eventually. When it does, value will again have its day. 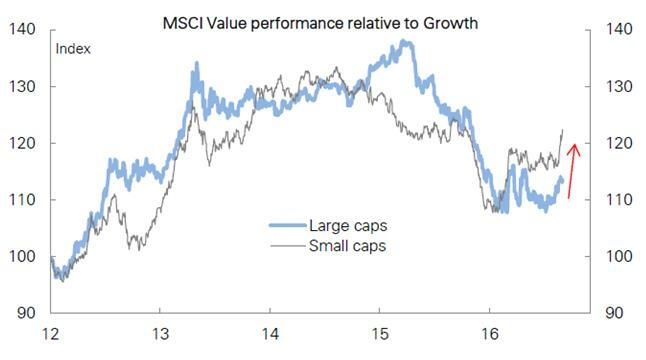 For value investors there has never been a shift away. The conventional definitions of a value or a growth stock adopted to try to identify shifts in investment styles don’t fit with our own definitions. One research house, for example, defines the stocks we own as ‘high growth’ and yet we would only describe ourselves as value investors. Growth and value are two sides of the same coin. You cannot define value without estimating the growth. I think the definitions were created by a marketing team to differentiate their employer from the others. Deep down most people are value investors at heart. Offered the opportunity to buy the item they want at a cheaper price, most would jump at it. The conventional definition of ‘deep value’ however associates with those who might buy businesses on their knees and requiring the implementation of a turnaround strategy. Ask most people whether they want some junk at any price and you will find a great number turn and walk away. And so, the conventional industry definition of value investing doesn’t reconcile with the way most people behave. Therefore value investing has never been unfashionable. "The very term ‘value investing’ is redundant. What is ‘investing’ if it is not the act of seeking value at least sufficient to justify the amount paid? Consciously paying more for a stock than its calculated value — in the hope that it can soon be sold for a still-higher price — should be labeled speculation.” Warren. E. Buffett. “The whole concept of dividing it up into ‘value’ and ‘growth’ strikes me as twaddle. It’s convenient for a bunch of pension fund consultants to get fees prattling about and a way for one adviser to distinguish himself from another. But to me, all intelligent investing is value investing.” Charles. T Munger. These old 'Axioms' of our industry including "Thematic," "Top down." "Bottom Up," "Benchmark unaware" etc, etc are rubbish and should be laid to rest for good. There is just 'Investing."